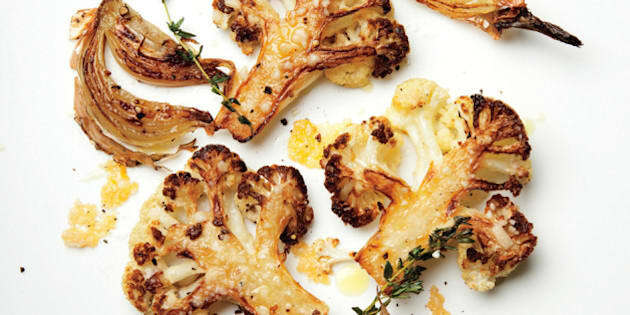 In case you missed it, cauliflower is officially the new kale of 2014 — and for the most part, it really deserves this title. This vegetable can grilled, roasted, barbecued, blended, mashed, eaten raw or made into rice or crusts for people who following a gluten-free diet. Not only is cauliflower incredibly versatile in cooking, it has tons of health benefits nutritionists and doctors can't get enough of. Great for your liver, cauliflower is known to flush out toxins, help with digestion and act as an antioxidant, according to 3 Fat Chicks. One head of cauliflower (yes, it does look like a brain), is about 210 calories, while a 100 gram serving counts towards 80 per cent of your daily vitamin C intake — that's a lot! And in case you missed it, last week we packed raw foods. This snack recipe is gluten-friendly, a little chewy with, of course, the right amount of crunchiness. Get the full recipe from The Balanced Platter here. A low-carb option even kids will love — seriously, they probably won't realize they're eating vegetables. Get the full recipe from Real House Moms here. Blend your cauliflower into a soup to make the perfect afternoon snack or even lunch. Get the full recipe from Two Peas and Their Pod here. A great winter snack that adds serious flavour to the veggie, this recipe includes onions, garlic and cheese.Get the full recipe from Bon Appetit here. This one is for the vegetarians and vegans who want to fit in on wing night. And yes, you too will get to deal with messy fingers when you're done. Get the full recipe from Closet Cooking here.